I received a lot of great feedback after writing about my experience at the end of the Track Triplet at the 2012 Reebok Crossfit Games. It got me thinking, this can be dangerous at times, and I realized that very few people are writing about what is going on inside there head during the Crossfit Games. So I have decided to write a series of blogs about my experience at the Games. This was my 4th trip to the Games, my first was 2008, second 2009, third 2011, & fourth 2012. I have learned so much every single time I have come and I am still learning so much about the Sport of Crossfit but more importantly about myself and what drives me. Here is a look into my mind at the end of the Track Triplet and where these thoughts or overcoming these thoughts come from. Little moments like this when you challenge yourself and break through mental barriers. This is what its about. When you have nothing left but you sprint to the end. (I preach this to the athletes at our Box, Crossfit Kinnick, day in and day out. So its nice for me to be able to practice what I preach. I can talk a lot sometimes but I prefer to lead mostly by example and let my actions speak for themselves.) Then you look back and realize maybe you had a little more in the tank than you thought. For me the Crossfit Games is 100% about battling not other athletes but your inner voice that tells you to stop or slow down or it hurts or you don’t really need to go that fast or the guys around you are better than you and so on. Overcoming those voices and overcoming our body wanting to get out of the pain cave is what the Crossfit Games are to me. As I am running the last lap all these thoughts and so many more are flooding my mind. Mixed in there are the quiet voices from the crowd around me…like Jake Mannion (Crossfit Kinnick Head Trainer & good friend) cheering me on, then Jonathan Kinnick (My younger brother, the guy who made me start Crossfitting, Co-Owner of Crossfit Kinnick & Co-Founder of Beyond the Whiteboard), then my coach Brian Mackenzie (Crossfit Endurance Founder, my friend, my coach & programmer this past year). I want to make these people proud and push harder but those voices can’t make me push any harder. As I come to the last turn before the final straight away it hits me. I reflect on the past year and the sacrifices that I made and that my family has had to make for me to train and prepare. Those countless hours spent at the gym when I could/should have been home. And that is what flipped the switch for me. My desire to fight for my family, for my 2 boys Carson almost 4 years old & Clayton almost 1 year old. And for my wife Giermaine. The women who tends to my every need so that I can keep going and focus on my training and making sure that I am doing everything in my power to be prepared and to be able to be in the position to Glorify my Lord through my actions. In front of God, my family, and the rest of the world. The placement isn’t the important part. Its me against myself. I am my toughest opponent. I am the one who makes me go slower or doubt myself in situations. Its about not letting the sacrifices of others take second behind my selfish desires of my body to not endure more pain. I refused to let my body win. At that moment there was no way that I was not going to catch the guy in front of me. I share this with you guys because we all face these choices daily. As some of you may know, I have spent a lot of the past year or so working very closely with Tony Blauer, Founder of Blauer Tactical & the SPEAR system which stands for Spontaneous Protection Enabling Accelerated Response. I have been to countless Be Your Own Bodyguard Workshops both as a student and as an instructor. I took and passed the PDR Instructor Course in Encinitas, California at Seal Fit. After meeting Tony for the first time I was drawn to his system as it immediately resonated truth, much like my addiction to Crossfit. The physical aspects of the system have given me a mental edge in my daily life knowing that I now have some tools in my arsenal but more importantly the mental/psychological aspects have truly altered my entire life from my understanding of how our mind works and processes situations in daily life to improving my Crossfit life by understanding how my mind affects my performance before and during my WODs. We have to give our self permission to be our own bodyguard and protect our self because no one else will. How this is done is by first realizing the 3 P’s (PERSONAL, PASSIONATE, & PRESENT). What is important to you, what you need to get home to, what you need to protect yourself for. For me, my 3 P’s are my sons Carson & Clayton. They need me to be there for them. To raise them and teach them how to be a man. To protect them from people who want to do them harm and lead them astray. To provide for them. This is what drives me. What makes me fight back in those moments when I don’t think I can. When I am stuck in the FEAR Loop and cannot make a decision or snap out of the paralysis that has overcome my body and all the negative thoughts and reasons why I can’t fight back. In that moment as I was running my last lap I had to remember my 3 P’s and fight back because I was stuck in the FEAR LOOP unable to move any faster. This element of Tony’s philosophy has dramatically improved my performance in Crossfit and in life. I hope that this insight will help and aid you in your life & Crossfit. 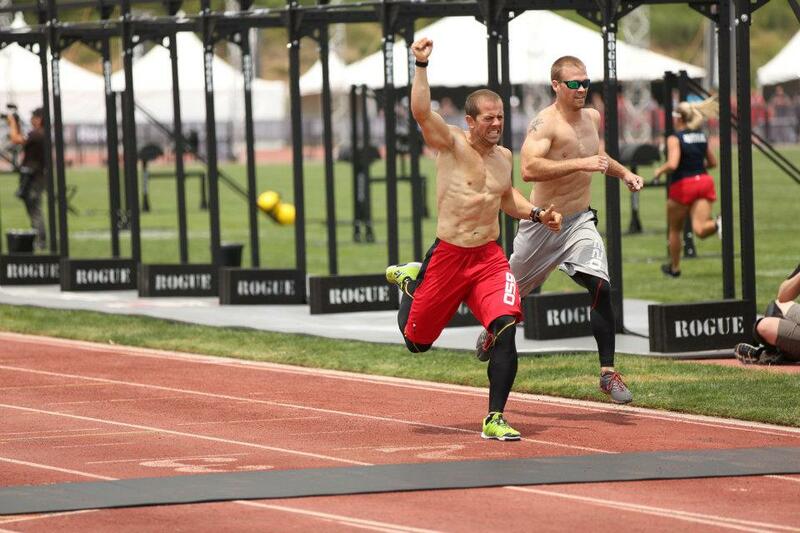 Expect more insights into my experience at the 2012 Reebok Crossfit Games coming soon. If you have any questions I welcome them. Let me leave you with this one last piece or bit of advice that I have heard Tony tell classes and people so many times. Right now is the best you are. There is nothing you can do to improve your body. The only thing you can do is adjust or change your mindset. Previous Post2012 Reebok Crossfit Games Kinnick Butter Shirts!! !Next PostNutritional Success! Coach and a real champion! You words and thoughts are deep and right on! We feed so much on negetive toughts and make it powerful, you show and live in a possitive frame of mind! Thank you Jermey Kinnick! Proud of you and that woman of God that stands behind you!